When choosing an OBD2 scanner, you can either find something that’s built to offer a wide array of features and functions, or you can opt for a model that’s a bit more simplified. With the Launch CR7001, you’re getting one of the latter. However, even though this device could be considered a “standard” OBD2 reader, it offers substantial functionality that makes it better than most others in its class. Let’s see what it can do. One thing that we like about this scanner is that it’s both compact and has a slim design. Other brands tend to be bulky and cumbersome, which can hinder your ability to navigate through the various menu screens. Also, having a massive scanner means that you won’t necessarily be able to keep it in the car (i.e., the glove compartment), which can impact its accessibility. A narrow frame makes this scanner feel more like a smartphone than anything else, which should be comfortable for almost any user. Also, with a four-inch backlit screen, you should have no issues reading any details, either. When it comes to the menu buttons, they are easy to figure out, and you can program specific hotkeys to make the scanner even more user-friendly. Since the information on the screen is easy to read, you can navigate faster and more efficiently, especially compared to some of the other “standard” readers on the market. With a 3.9-foot cable, you can easily read the scanner from the driver’s or passenger’s seat. This scanner has a relatively fast scan time, so you shouldn’t have to wait long to figure out what’s going on underneath the hood. We like that this scanner doesn’t require a battery to operate. Instead, it gets its power from your car directly, so you never have to worry about recharging the system to make it work. Another thing we like about this model is that it has multiple language options. Thus, if you feel more comfortable with something like Spanish or French, you can switch back and forth as necessary. Finally, you can update this scanner by connecting it to your computer via the USB port. This particular model comes with a one-year limited warranty, but you can update the software at any time, even after the warranty expires. All you have to do is verify your account, and you should be good to go. That being said, some Launch scanners can have trouble updating, so be aware that that may be the case. If so, you might want to get a replacement so that you don’t have to worry about the scanner becoming obsolete too soon. For the most part, this is a pretty basic scanner. 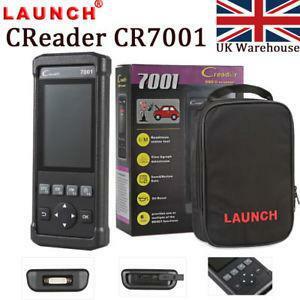 It contains information for 46 different car brands, including both foreign and domestic models. Thus, you shouldn’t have any problem finding your vehicle’s codes with this device. As with all OBD2 scanners, this model is designed to help you diagnose your check engine light. However, what makes this unit even better is that you can live stream data from your car, as well as check onboard diagnostics from your vehicle’s computer. Once you’ve figured out the problem and fixed it, you can then reset the light immediately. Another feature of this scanner is that you can reset your oil light. If you prefer to change your oil yourself (instead of taking it to a mechanic or lube shop), then this feature is handy. If you don’t, however, then it won’t make much of a difference. 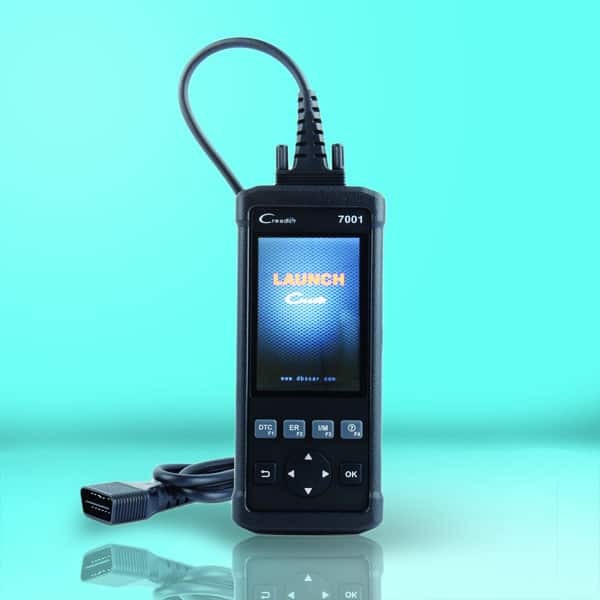 Launch has cemented itself as a world-renown maker of high-quality OBD2 scanners, and the 7001 model is an excellent choice for casual car enthusiasts everywhere. With a vast array of makes and models included, as well as a streamlined design, you can do a lot with this machine.